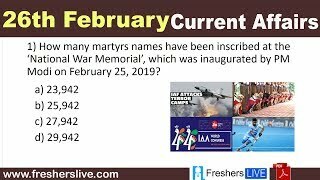 Current Affairs 26th February 2019: Instantly obtain Latest Current Affairs 26th February 2019 with all essential info, Be the first to know all the Current affairs 26th February 2019 top news, Major Issues, Current happenings, Important events in National as well as International level with clear explanation. For all competitive exams and Interviews, equip yourself with the Latest Current Affairs 26th February 2019 granted here. Craft will replace former US Ambassador to the UN Nikki Haley, who resigned her post in October 2018. Kelly Craft is currently serving as the US ambassador to Canada, since September 2017. She has also been a strong backer of the US-Mexico-Canada Agreement - pioneered by President Trump as a replacement for the North American Free Trade Agreement (NAFTA). Jonathan Cohen is currently serving as the acting UN ambassador. The RBI has extended its February 28 deadline for completion of KYC (Know Your Customer) norms for digital wallets [prepaid payment instrument (PPI) issuers] by six months. PPIs are instruments that facilitate purchase of goods and services, including financial services and remittance facilities, against the value stored on such instruments. Zimbabwe started to trade its new currency, the RTGS dollar, two days after the central bank announced measures to try and resolve a chronic monetary crisis. The bank unveiled a foreign exchange trading system that effectively devalued its quasi-currency, the bond note, which was officially pegged at parity with the US dollar. Indian government confirmed that Indian Air Force (IAF) jets destroyed the biggest training camp of Jaish-e-Mohammed (JeM) in Pakistan's Balakot in the strike carried out by 12 Mirage 2000 fighter jets. IAF dropped around 1,000 kg bombs on JeM terror camps across the Line of Control (LoC) in Muzafarabad sector on February 26, 2019. The IAF carried out the successful operation 12 days after Pulwama attack, in which 40 soldiers were martyred. Pradhan Mantri Kisan Samman Nidhi (PM-KISAN) scheme was announced in Piyush Goyal's interim budget 2019-20 and is completely funded by the central government. Under the PM-KISAN scheme, Rs 6,000 will be given to 12 crore farmers with less than 2 hectares of land, per year in three instalments. Jio Saavn India-based global audio and music that it scored the 1st rank among Indian companies and 28th rank globally in the 2019 list of “50 Most Innovative Companies”. Jio Saavn is the only Indian company to have made into the list. The other domestic companies that ranked top on the India list of “Most Innovative Companies” are OYO rooms, biodegradable sanitary pad manufacturers Sathi and app based can service Ola. Bihar becomes the first state to deploy specially-trained dogs to check to smuggle of liquor. Around 20 liquor-tracker dogs were trained for nine months in Hyderabad, Telangana. They were trained at Hyderabad-based Integrated Intelligence Training Academy. Patna will witness deployment of 4 such dogs. This action was taken after the seizure of more than three million litres of illegal alcohol since April 2016.